This morning a black package arrived in the post, it was held together with black tape, and contained a black envelope on a bed of black crushed paper. 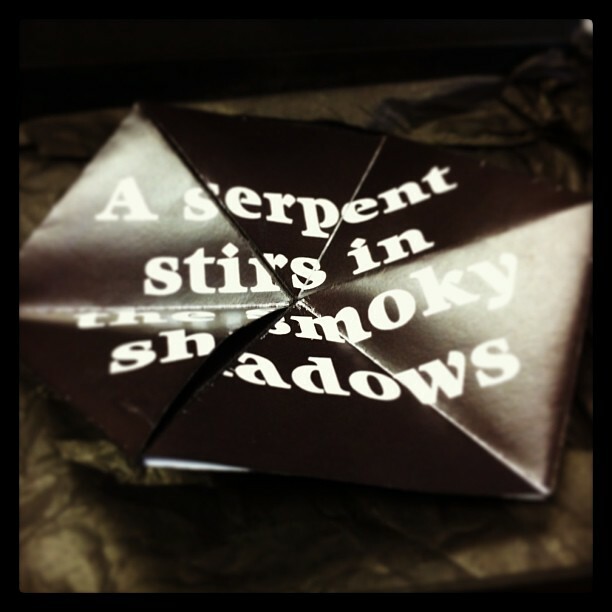 A Serpent Stirs in the Smoky Shadows. I’m not sure what highland park are up to, but it should be interesting to find out. I do have some of there new ‘warrior’ whiskies, which the must be related to, so I would presume these are related. It also says ‘all is not as it seems’ if you fold it over again like a magic box. I write on the occult as well as booze so initially I thought I’d been cursed and it was quite thrilled. Only whisky to follow, no bloodied goat’s head, ho-hum. Ooooh interesting! I’m glad it’s not a curse… I hope there is more to this than the origami and some samples; I love a good puzzle or mystery.